A healthier, easy take on a classic party pleasing appetizer. 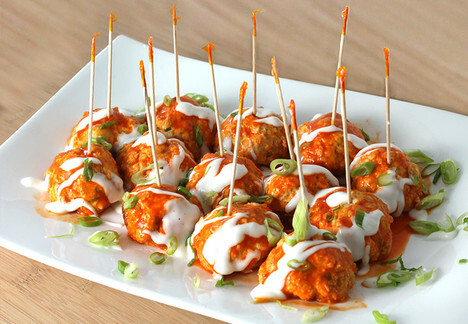 For the buffalo chicken meatballs: Add chicken to a food processor and pulse until roughly chopped. Transfer to a medium bowl and mix with green onions, garlic, ¼ cup hot sauce, eggs, breadcrumbs and salt. Form into bite-sized balls. Pour ¼ cup of hot sauce into slow cooker then add meatballs. Cover with remaining ¼ cup hot sauce. Turn slow cooker to high for 2 hours. For the light ranch sauce: In a small bowl, stir together ranch and sour cream. Keep refrigerated. Transfer meatballs to a serving platter, cover and keep warm. Strain remaining sauce into a small sauce pan. Cook on high and reduce for 5 minutes. Pour over meatballs. Garnish with ranch sauce and green onions.